Functional architecture: MR is about cognition gathering and correlation in a way that enables you to find what your are looking for extremely efficiently (following SW and brain paradigms). As my personal mind map grows (hundreds of concepts), I see lack of features allowing to efficiently navigate and search the map. Although I know what I'm missing, it would be problematic to implement these new features on top of the existing MR technical infrastructure. Technicall architecture: former MR releases (up to version 0.512) primary purpose was SW technology trainer. I didn't pay enough attention to the architecture - it was monolith with extremely complex dependencies (and initialization) that have large memory footprint and big portion of dead+undead code. 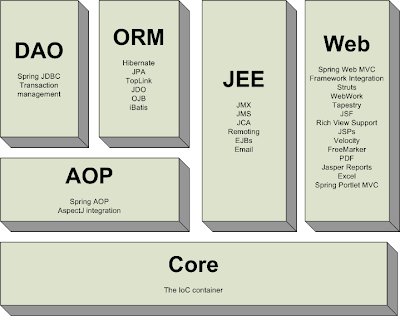 I fall in love with Spring (dependency injection container in particular). I hope the create nice declaratively described component architecture (avoiding singleton and factory patterns). I want to design independent presentation and repository tiers. Thus I would like to get filesystem, but also RDBMS and remote repository variants enabling to perform complex searches and views of the mind map maintained by MR. It's the right time for new ideas, features and also technical architecture proposals and suggestions. I'm looking forward to your feedback and criticism. I'm not a coder, but I believe MindRaider can be a very useful product, especially as the number of people constructing ontologies increases. I downloaded the application and I have just started playing with it. Very impressive work! If I can use the current implementation to subsume my JOE (Java Outline Editor) habit, I would have a long term interest in extending/maintaining a tool like MindRaider. which used RDF to make aggregates of microcontent like vcard, calendar events, notes. In other words, ontology-based personal information management. As a side-effect, it would also work for ontology development. If similar past projects are any guide, I think it is wise to make it work well for a single user before attempting any groupware features except for simple sharing notebooks by copying.